Shaker personalities now available on t-shirts! Click here to see the storefront and purchase options. 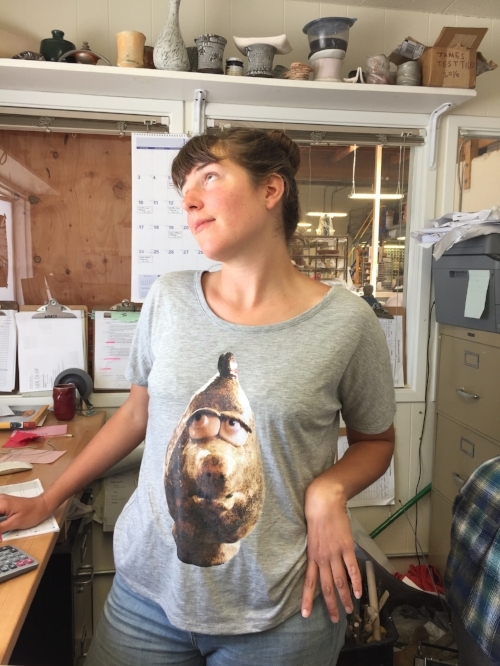 Leah wearing "Bucky" at The Potters Studio in Berkeley. Anna wearing "Anna" In Taos, NM! John sporting "Perry" at the Sydney Opera House! Eileen wears Darcy to work out in! One month-old Violet sporting “William” in her onesie! A cute kid I met and sold a t-shirt to at the Oakland Museum Friday Night Festival—she’s wearing Goldie! Andrea looking very "Perry" at The Potters Studio! Linnea, almost one in a Gilbert onesie!